The competition brief called for the urban concept and architectural design and development of Sveta Nedelya Square, in the city of Sofia. 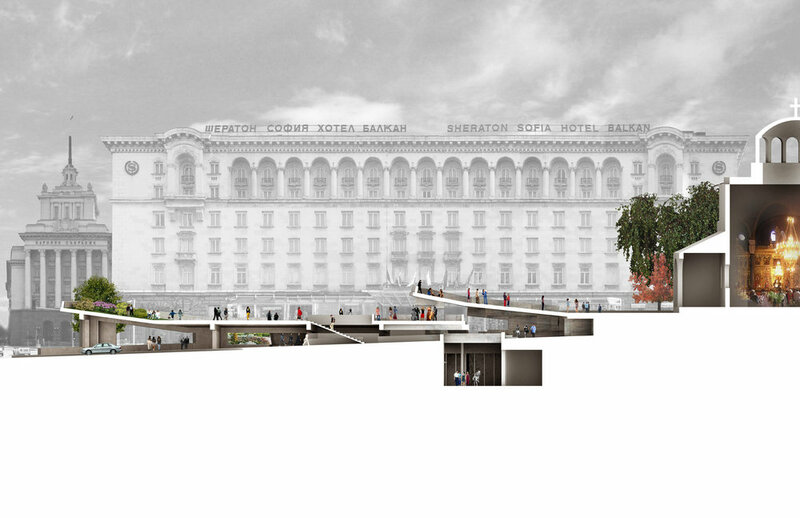 The main strategy for the project is to provide a clearly defined plaza for congregation in the heart of Sofia. To achieve this, we propose a plane which “peels” away from the north side of Sveta Nedelya Church and floats over Boulevard Vitosha. This ‘plane’ alludes to the historical use of that area of ancient Serdika. Some of the geometrical lines of the plaza disposition are carried over from the angle introduced by the Roman Cardus and Decumanus and the Forum. Furthermore, we are proposing an extension of the existing underground level considering that new ruins will be uncovered and to provide a connection to the subway system. 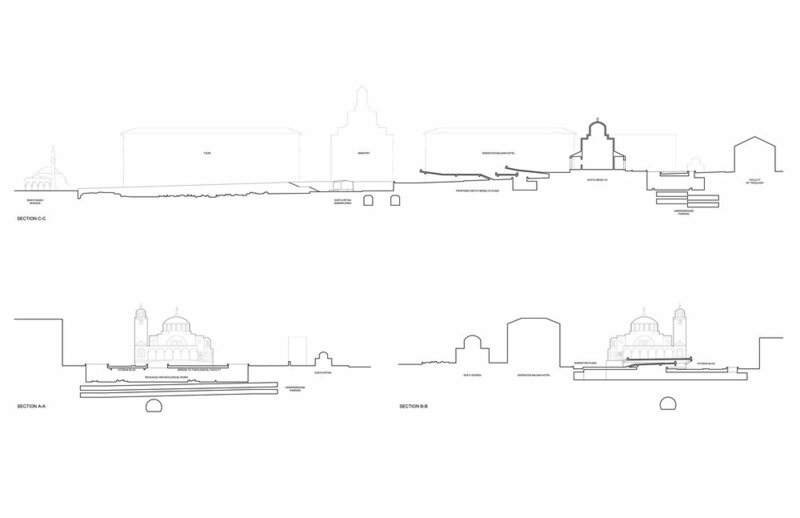 Three levels are present in the proposal; the floating plaza, street level, and archaeological level. 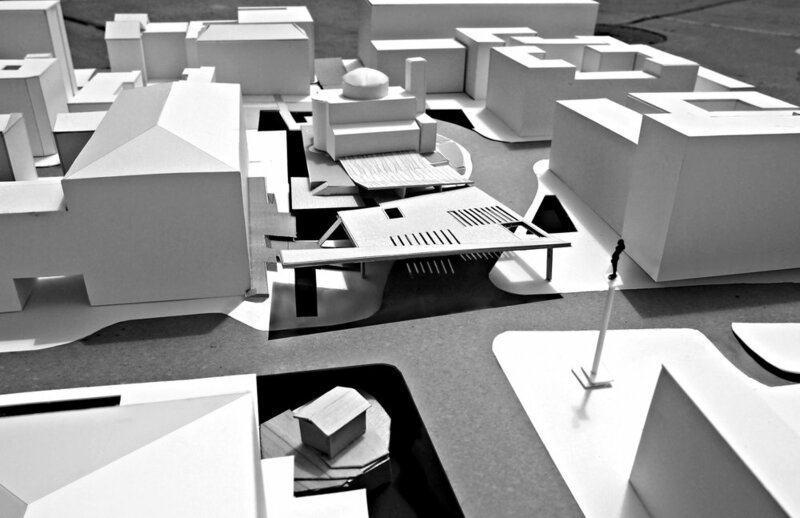 By introducing the floating plaza, it essentially doubles the ground plane. 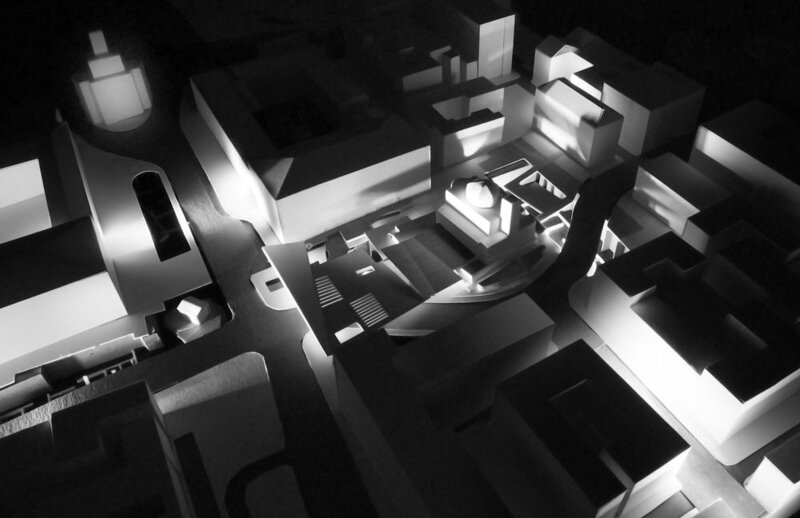 The intention is to have clearly defined congregation area but with a variety of overlaps between the levels; the idea being generated from Eduardo Chillida ‘Gravitacion’ series. One can see flat planes engaging in several overlaps and providing a series of layer which could in turn be read as archaeological, or perhaps even geological formations. The most symbolic aspect of our proposition is that all human interventions are a part of a larger time-frame. We have considered that a pedestrian network of the underground and street levels can establish an uninterrupted loop from the Banya Bashi Mosque and the Public Mineral Baths South to the Ivan Vazov Theater as well West to the 'Women’s Bazar' and to the West Roman Gate. We have identified that the area contains a vast transportation network. The initial decision to lift the plaza above Boulevard Vistosha came in part because we felt that reconfiguring the vehicular pattern would not be a viable (nor successful) solution. We are proposing to keep the existing tram. In addition to strengthen the existing connection to the subway we are proposing the extension of the archeological level revealing ruins to the south of the Roman Forum. Underground parking has been provided which can be accessed from Saborna Street and Sveta Sofia Street (this structure will be ‘sandwiched between the newly uncovered archeological ruins and the new North-South subway line.